This is Whiskers and this is the second time she has dug multiple large holes in the flower bed. Apparently the first “shaming” didn’t work. We don’t know what type of dog she is, perhaps it is some exotic breed that lives in burrows….. He is a Jack Russell Terrier and is bred to go to ground and dig for rodents. Make him one bed for him and plant treats/toys in the dirt. Teach him that this is the only one he can play in and he will “hunt” with you only on your command. Leaving the other beds alone.Lot’s of info online about this. They are the sweetest dogs ever~! Comedians too. I have one too. We call him a “Canardly”. As in you can hardly tell what he is. He’s a shaggy too and he loves the gophers. And kitties. And dogs. And kids. Etc. He could be…I’ve never seen a gopher so I actually don’t know for sure. Maybe Whiskers doesn’t know either. I was going to say Jack Russel Terrier and he is going to do that forever unless you train him to a specific spot he can dig in. See previous post. Fox terriers will do that too some. Yes, definitely got some Jack Russell in him. I have one, too. I let him get all his digging urges out at the dog park. I don’t know what he is, but I know he’s definitely gorgeous!!! What. A. Darling. Dog. 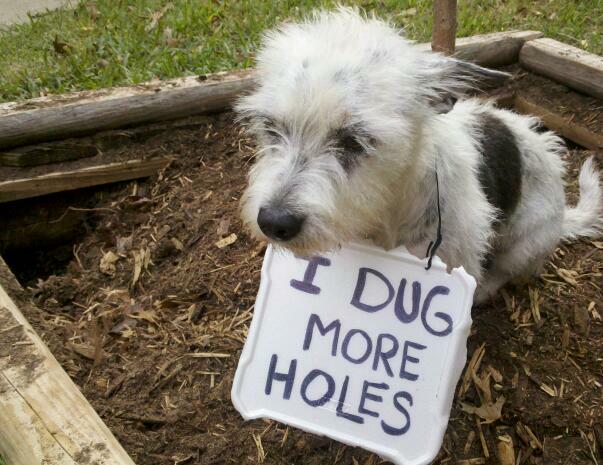 He’s a terrier, and he was put on this earth to dig. He is fulfilling his destiny lol :). I like the previous commenter’s idea of giving him a special area to dig, with toys hidden in there as “prey prizes”. My dog looks exactly the same. She burrows as well but never in the yard – just in beds 🙂 she’ll jump up on one and burrow beneath the covers. Everybody keeps finding “lumps” in their beds. We take her camping and she does the same thing.